I got this Washi fabric back in March with no idea what to do with it (but I knew that I loved it) and to think -- I almost walked out of the store without noticing it. Gasp! Read more about that delightful day here. 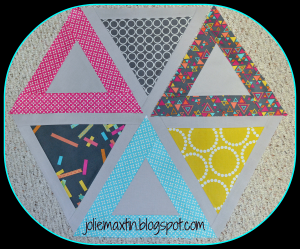 But alas, I have cut into it and am so excited about my Triangle Quilt! I have it all cut out, except for the extra piece of blue that had to be re-ordered because I messed up (and really....I don't mind buying more fabric - it's fun). The blocks have started to come together and it is about half way done, so hopefully I will finish this by the end of the month. How long does it take you to cut into fabric you love? When I know what to do ? Not long because I'd rather have a quilt I can snuggle under made out of fabric I love than fabric I love sitting on the shelves.. Your quilt looks great (from what I can see!). Those metro circles just find their way in every project don't they ? Cool triangles! I'll have to let you know on your question since I have a few yards of different fabrics I love that I still haven't used. Even though I did recently use up almost all of a fabric I'd been saving for a couple years for the precious QAL. It's looking great, I can't wait to see it all together! Keep up the good work. Your quilt is going to be wonderful! Can't wait to see it. Don't you LOVE the Washi?! Your quilt will be so fantastic. I'm making one too from spiderweb blocks. It takes me a while to cut fabric I love! I have some of the washi and haven't cut it up yet - but I think I'm going to make my daughter a pencil case (I know that's small) and probably one other thing.